Have you thought of turning pro? Of making money from your photographic skills? If so, you'll find this app useful. It explains the issues you'll need to understand when it comes to becoming a professional. 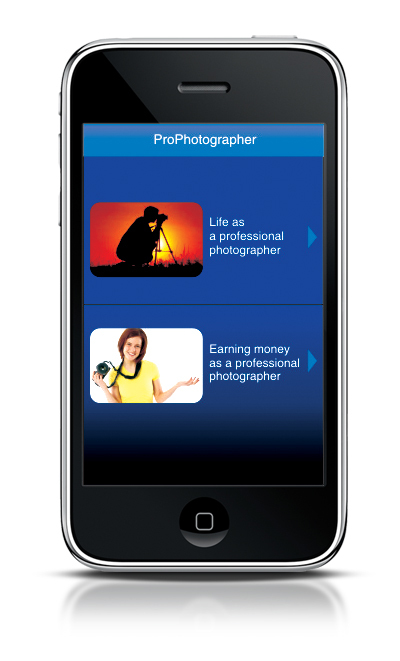 There's plenty of advice in this app, covering many aspects of making money from your camera. And soon we'll be adding updates, to give you even better advice on setting up on your own. If you get the app, you'll be notified as soon as updates become available. We'd also welcome your feedback on what you've found useful, and what you'd like us to include in future versions. Best of all, there's no charge for the app. So click the Download button, and you'll be taken straight to the app in iTunes. Contact: Miki Petrusic in Sydney, Australia. Tel: +61 2 9620 4066. Contact: Hester Burnett in North West Province, South Africa.